Of all of the things that I grow in my garden, berries are definitely on the top of the list as a favorite. They are so packed full of flavor when you grow them yourself because you get to pick them when they are perfectly ripe and juicy. Not only are they my favorite thing to grow, but they are my kids favorite thing that I grow! Everyday they head out to the garden to see if there are ripe berries. They usually eat more than they bring in with them – but that is a good thing in my mind! By following a few gardening practices, your berry plants can produce an abundance of nature’s most delectable food. We will be talking about Blackberries, Strawberries and Raspberries. Berries are perennials and so will remain in the same spot for several years. When you are planting, pick a spot with good soil, or fortify it by adding lots of organic material before planting. Every area and climate has its own challenges and also benefits, so you may have to alter some of the things you do depending on where you live. Blackberries, raspberries and strawberries require a lot of the same fertilizing and watering practices and so I am going to talk about these in general. Berries are ‘acid-loving’ plants and so if your soil is alkaline you will need to add some things to make it more acidic. One really good way to do this is by adding sphagnum peat moss to your soil. It will not only improve soil texture, but it has a lower ph and so will acidify the soil. You can also add elemental soil sulfur to your soil especially if you live in the west as western soils tend to be more alkaline. It is also good to add a complete fertilizer (nitrogen, phosphorus, potassium) as well as iron, zinc and manganese into the soil along with the organic matter before planting. This will give your berry plants all of the nutrients they need to grow well. Berries love water. The best way to water is with a drip system so that you are not saturating the leaves and berries. They should be watered 2 times per week – and long enough to soak the bed thoroughly but not water-log it. The length of watering will somewhat depend on how hot your climate is. 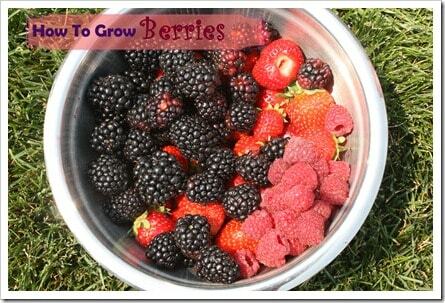 These berries are great to grow because they are fairly adaptable in different climates. They tend to do well even in hotter areas where other berries may not. My blackberries are Triple Crown. They are a thornless variety which is great when kids are involved. I have my blackberries on a trellis to keep them off the ground. My strawberry plants are mostly Albion with a few Ventana mixed in there. One important thing about strawberries is to remove the runners. This will help your plants produce more berries by keeping the strength in the plant and not putting out runners for new plants. These berries also come in June bearing and Ever bearing varieties. June Bearing varieties: Prelude, Encore, Canby, Meeker, Newburgh, and Tulameen. June bearing varieties produce their fruit on second year canes. So in the winter when the leaves are gone, you should remove all of the canes with produced fruit the prior summer. Every Bearing varieties: Autumn Bliss, Dinkum, Heritage, and Fall Gold. These varieties produce on first year canes. You can cut off the tops of these canes where they produced berries and they will produce a smaller crop further down the next spring. If you cut down the entire cane in late fall or early spring, they will produce one very large crop each year. Growing berries does take some patience, time and care, but it is so worth it!